Hublot & TAG Heuer Sponsorships: Is Biver secretly the God of Gamblers? Hands-on analytical review with high resolution live photographs. The year 2017 will be remembered as a special one for all the folks at Greubel Forsey. For this year, they join an exalted rank of manufacturers – Patek Philippe, A. Lange & Söhne and F.P. Journe, among others – that have accomplished a grande sonnerie wristwatch. Ask any watchmaker worth his salt and he will tell you that the grande sonnerie is immensely complex, even more so than a minute repeater, which is why only a small handful of manufacturers have managed this feat. 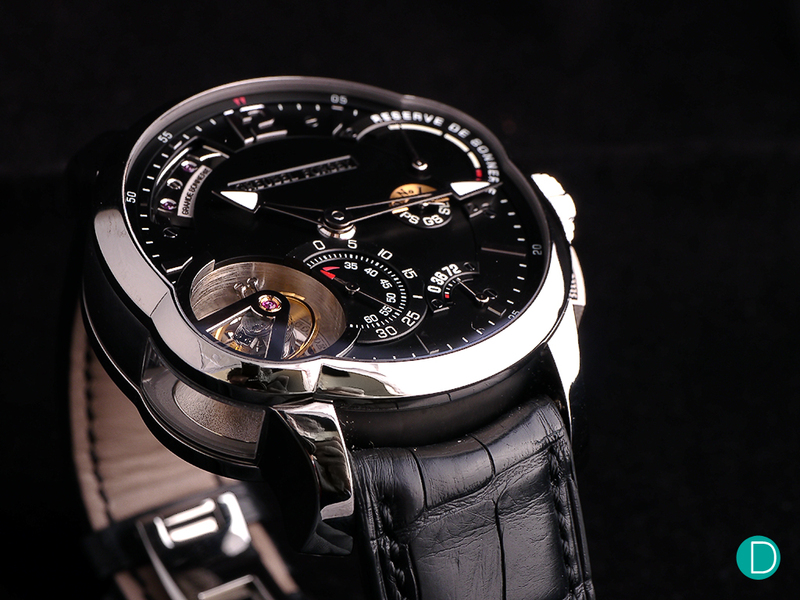 The Greubel Forsey Grande Sonnerie though, is more than just a watch with a grande sonnerie – it also has a petite sonnerie and minute repeater function. The grande sonnerie chimes the hours and the quarters at every quarter hour, while the petite sonnerie chimes only the hours. The minute repeater chimes the time to the nearest minute on demand, unlike the grande et petite sonnerie which chimes en passant. 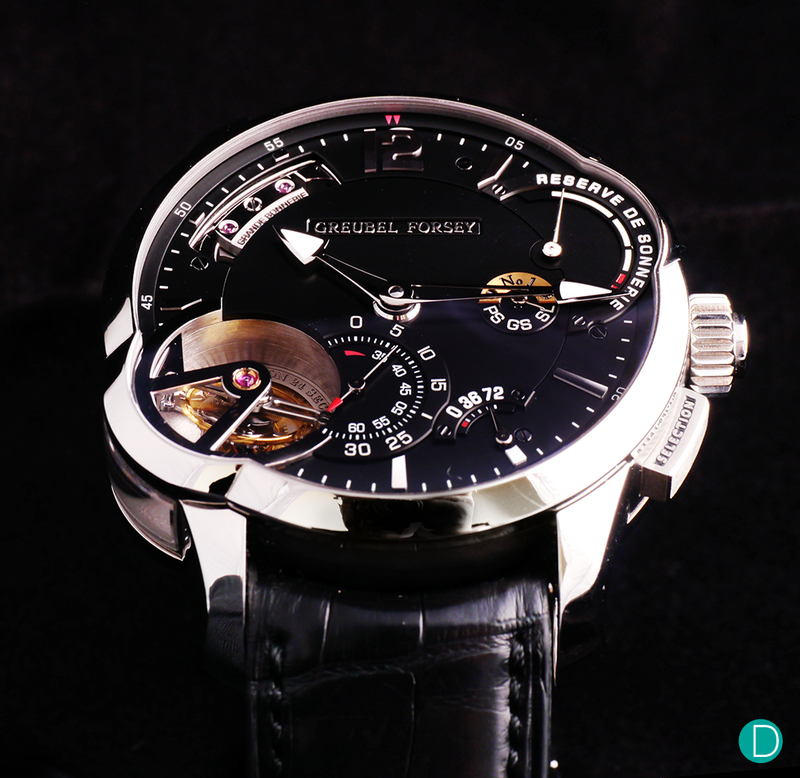 Here we bring you the details and our thoughts on the Greubel Forsey Grande Sonnerie, a horological giant that reportedly took 11 years of research and development. The case of the Greubel Forsey Grande Sonnerie measures 43.5 mm in diameter and 16.13 mm in thickness. In spite of its large size, the watch does not feel cumbersome on the wrist thanks to the use of lightweight titanium as the case material. The case is mostly round, although there is the brand’s signature case bulge at 8 o’clock to accommodate the tourbillon and another smaller one for the sonnerie power reserve indicator at 2 o’clock. On the case flank, you will find the crown located at the typical 3 o’clock position. 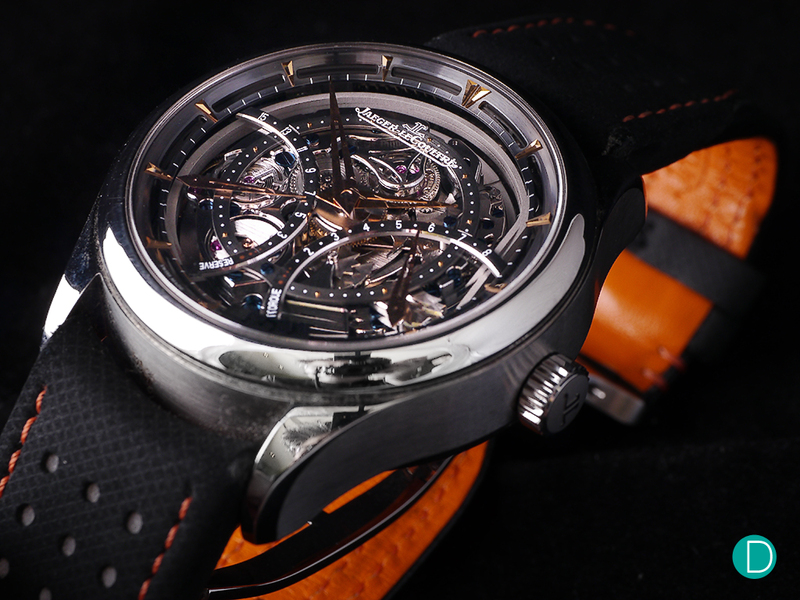 On top of the crown is a pusher that activates the minute repeater mechanism. There is also a pusher a 4 o’clock that allows the user to toggle between the grand sonnerie, petite sonnerie and silent modes. The Greubel Forsey Grande Sonnerie features user-friendly buttons for sonnerie mode selection and for activating the minute repeater. The dial follows design cues reminiscent of preceding Greubel Forsey timepieces with the use of a single applied Arabic numeral ’12’ and stick indices to mark the hours, the lume-tipped large arrow hands, and the placement of the iconic 24-second inclined tourbillon at 8 o’clock. Right next to the tourbillon aperture is the seconds sub-dial, and next to that, a power reserve indicator. At 3 o’clock there is also a strike mode indicator that lets you know if the watch is set to grande sonnerie, petite sonnerie or silent mode. A power reserve indicator specific for the sonnerie mechanism can also be found at 2 o’clock – this is a useful complication to have as the sonnerie works are quite power hungry. An aperture spanning from 10-11 o’clock lets you watch the hammers in action when the sonnerie mechanism is activated. Enthusiasts of Greubel Forsey will be familiar with the 24 second inclined tourbillon; hollowed, lume-tipped arrow hands; and the lone Arabic numeral 12. Turn the watch to its back and you will be greeted with a sight that will make your knees go weak. The 855-part, 85-jewelled movement measures 36.40 mm in diameter and 11.13 mm in thickness – large, but unsurprising given its monumental complexity. The manually-wound movement has a 72-hour chronometric power reserve while operating at a stately 21,600 vph beat rate. What’s interesting is that there is actually a self-winding system (evidenced by the winding rotor) for just the striking mechanism, which provides 20 hours of power reserve in grande sonnerie mode. Naturally, that power reserve will be longer if the watch is set to the petite sonnerie mode. Sonnerie wristwatches with winding rotors are a rarity in itself, as there usually isn’t enough real estate in a sonnerie movement to house an automatic winding system. Sonnerie mechanisms are typically power hungry. 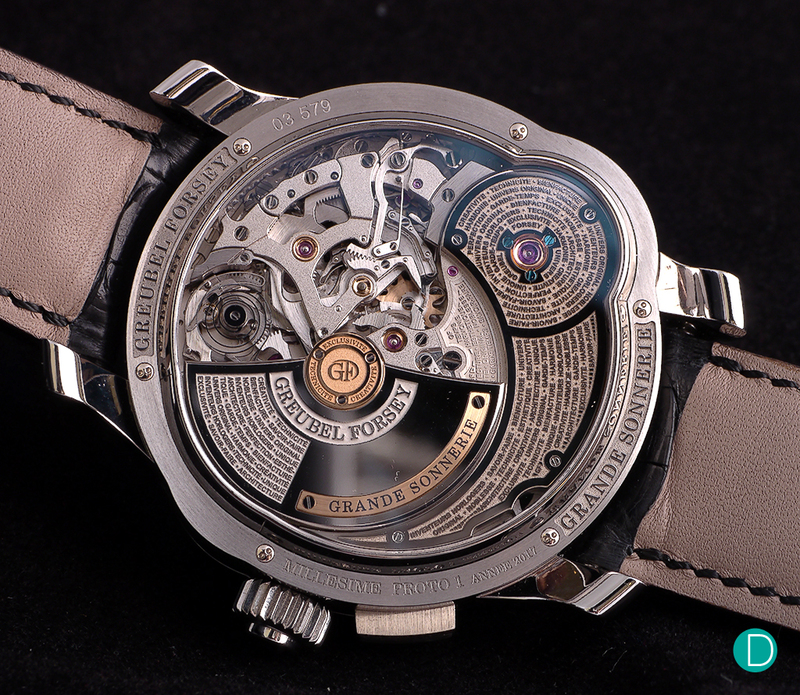 In the Greubel Forsey Grande Sonnerie, it is powered by a self-winding system (note the winding rotor). The striking mechanism of the Greubel Forsey Grand Sonnerie utilises steel cathedral gongs which, unlike regular gongs, are extra long (encircles the movement almost twice) and produces more resonance. What we found interesting about the gongs is that they are not entirely circular. In order to trace the shape of the case which bulges noticeably at 8 o’clock, the gongs had to be shaped likewise. This interesting design element can be seen most clearly through the side window on the case flank that overlooks the tourbillon. The sounds produced by the chiming mechanism is superlative in quality, thanks in no small part to a specially developed acoustic resonance cage made of titanium. Each note was loud and crystal clear – somewhat reminiscent of the Audemars Piguet Supersonnerie in that aspect – with a long sustain and decay. Importantly, the use of a silent governor also does away with any extraneous buzzing noise that might tarnish the purity of the sound. While gongs in chiming watches are typically circular, that is not the case in the Grande Sonnerie as they trace the shape of the case, including the bulge at 8 o’clock. 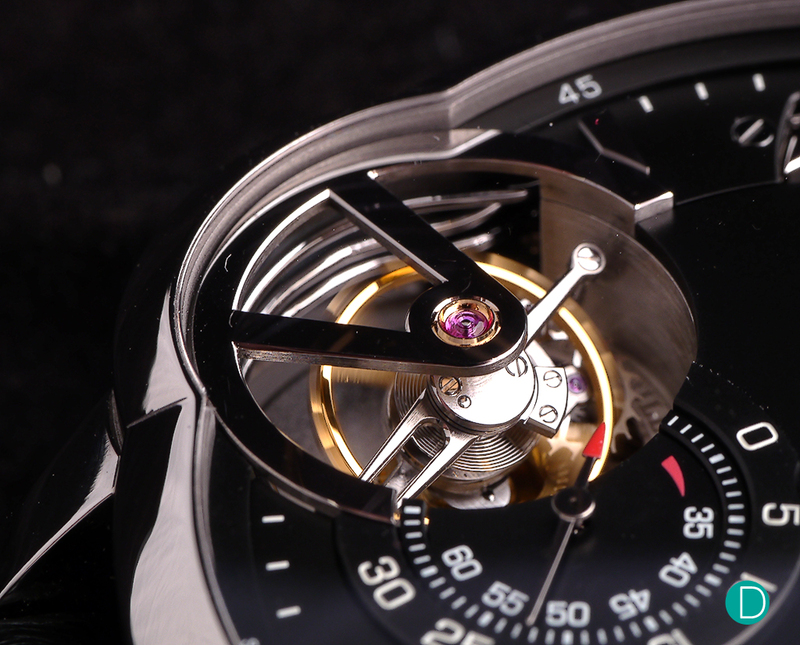 This can be seen clearly from the tourbillon aperture (as pictured) or the window on the case flank overlooking the tourbillon. 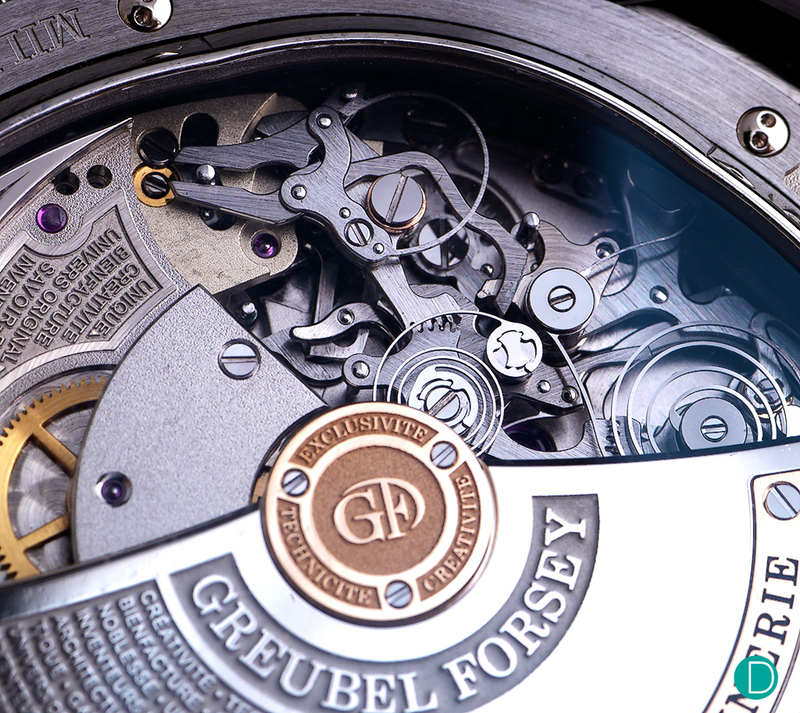 We would also like to highlight that Greubel Forsey has implemented 11 security systems in the Grand Sonnerie. These security systems are often undervalued in complicated watchmaking. We often underestimate what a moment’s lapse in concentration can do to wreak havoc in a complicated watch, no less a sonnerie watch. One of the security measures found in the Grand Sonnerie is a mechanism that disengages time-setting when chiming is in progress (and vice versa). Security measures like this are fantastic as they prevent accidental damage to the movement, thus sparing the owner (and his/her wallet) the pain of repairs. As an added bonus, the watch is also water resistant to 30 metres, meaning it is protect from water splashes. This enables the owner to wear the watch with a peace of mind, not fearing rain clouds or clumsy waiters. Few manufacturers venture into water resistant chiming watches as, indeed, water resistance is a double-edged sword. On one hand, it protects your timepiece from water damage but on the other, it inhibits the transmission of sound from the case. Some manufacturers like Patek Philippe opt to not seal any of its minute repeaters while others have chosen to overcome the conundrum instead with ingenious innovations such as the “crystal gong” from Jaeger-LeCoultre and now, the titanium resonance cage from Greubel Forsey. Water resistant chiming watches are rare, at least, the ones that sound good. The heel of the gongs of the Jaeger-LeCoultre Master Grande Tradition Minute Repeater (pictured) is connected to the front sapphire crystal. This allows the crystal to resonate as the gongs are struck, thereby permitting seamless transmission of sound even when the watch is sealed and water resistant to 50 m.
Technical feats aside, the Grande Sonnerie also features exemplary finishing like all other Greubel Forsey timepieces. The platinum winding rotor, as well as the plate next to it is mirror-polished and decorated with words that are relief-engraved onto frosted surfaces. While the wheels are circular grained, the hammers, screw heads and gold chatons are all beautifully polished to a blinding sheen. Safe to say that where finishing is concerned, Greubel Forsey remains one of the most diligent and meticulous manufacturers around. Every single part of the movement is meticulously and beautifully finished – there is not a hint of machining or stamping evident. …as well as the positioning of the displays on the dial (the small seconds, chronometric power reserve, and sonnerie power reserve). The Grande Sonnerie is, without a shadow of a doubt, a sonnerie watchmaking tour de force. 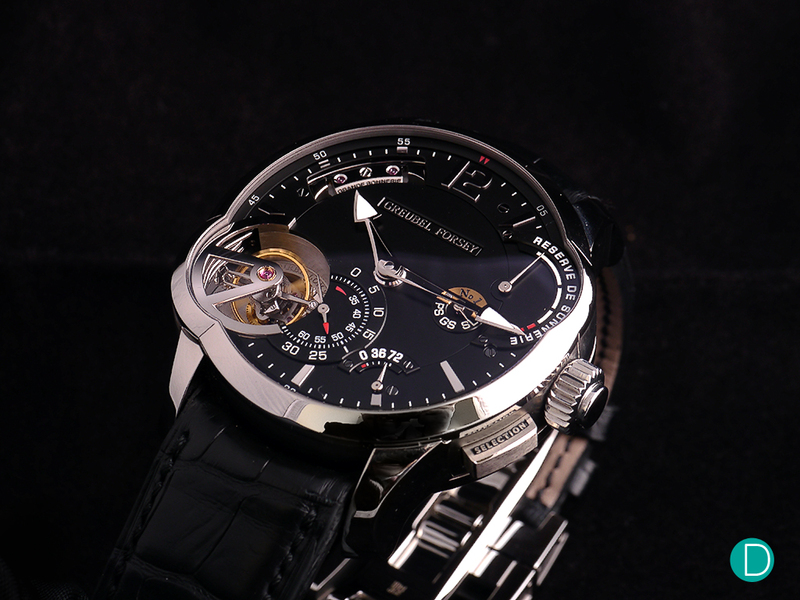 This latest masterpiece from Greubel Forsey is its most complex one thus far. While not a limited edition piece, production will be limited – only about 5 to 8 pieces will be made each year. At the price of CHF1,150,000, the watch is – for lack of a better word – expensive. But given the enormous complexity of the timepiece, we feel that the price tag is justified. The Grande Sonnerie may very well go down as one of the most impressive grande sonnerie wristwatches ever made with its outstanding acoustics, technical innovations and practical security features. And with this latest timepiece, Greubel Forsey continues to light the way, as specialists in high complication watches, masters of finissage, and as the cream of the independent watchmaking crop. 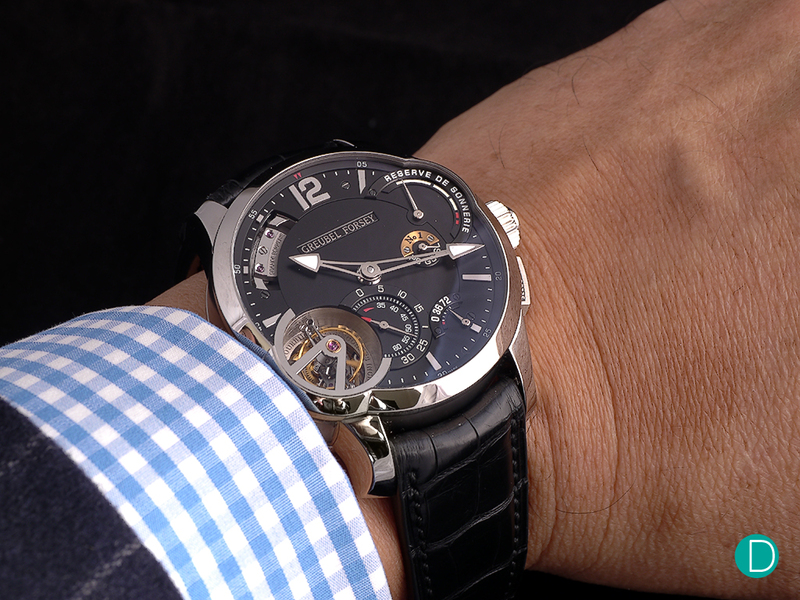 On the wrist, the Greubel Forsey Grande Sonnerie grabs but does not seek attention. It is the ultimate connoisseur timepiece as only those obsessed with all things horological and mechanical can truly appreciate it.